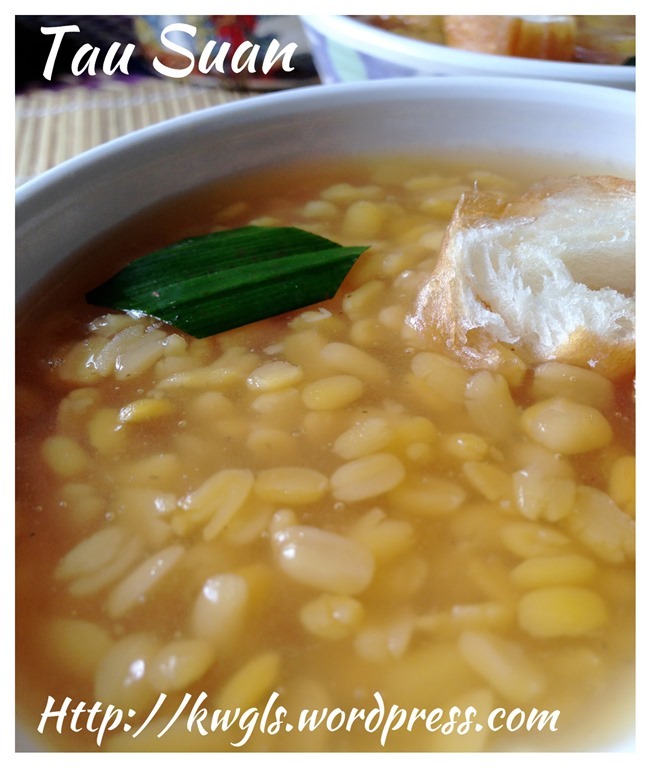 I have never formally have a recipe post on this mung bean or green bean dessert sweet soup though I have a simple recipe captured in my Guaishushu Page. It is a dessert that I can find in almost all the cities that I have stayed before. 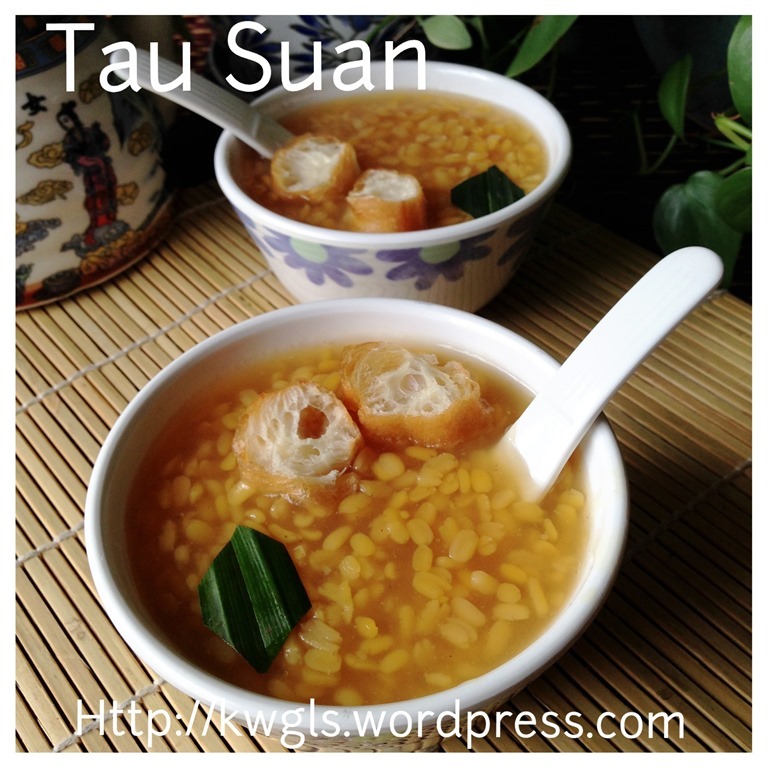 It was a thick starchy sweet soup, commonly served with Chinese breadstick or Youtiao.. 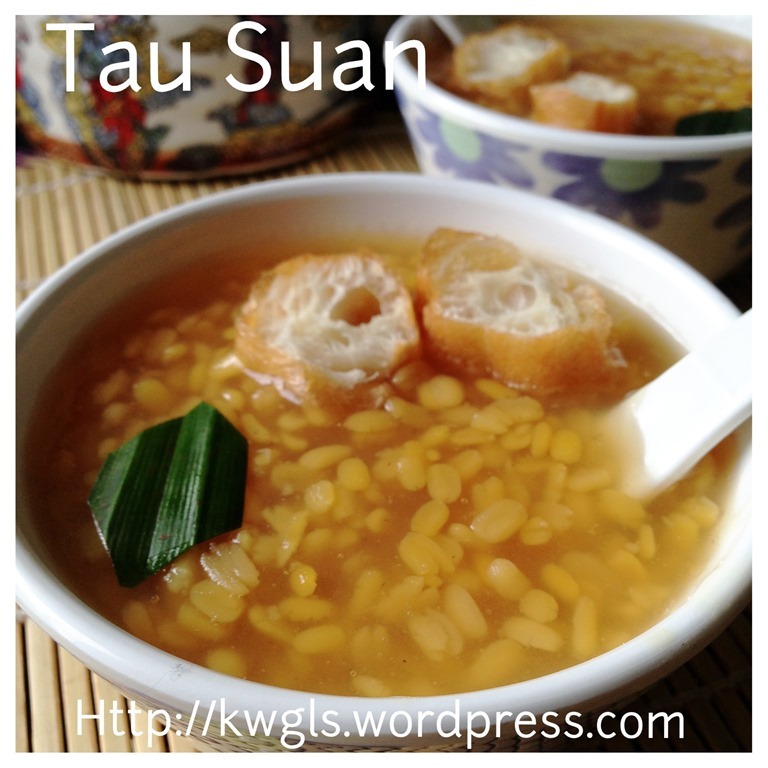 There are many method of preparing this dessert and I am sharing one that I used to eat in my home town, Kuching. It is the caramelized version those create a special aroma. Unlike those commonly sold in Singapore, the colour are slightly darker and personally, I preferred this version which I think it taste much better than those cooked with white sugar without caramelization. 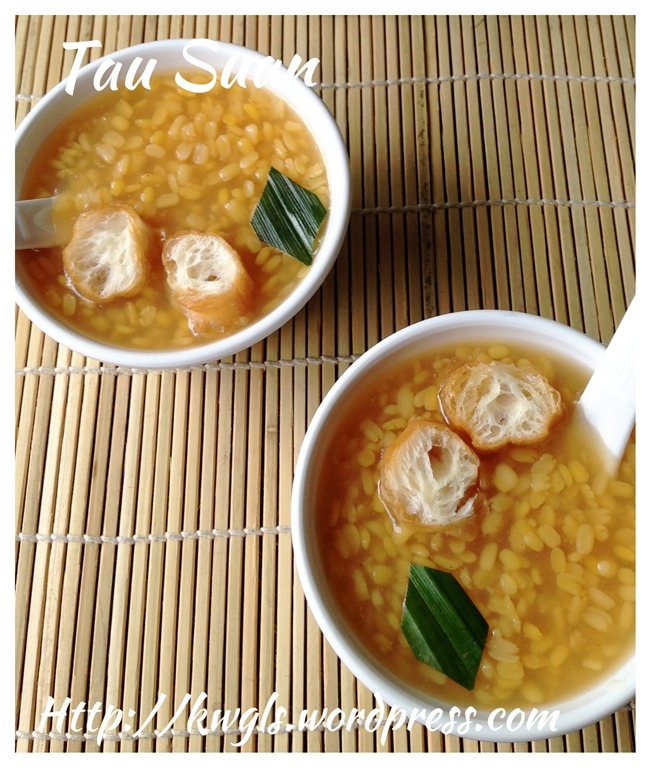 Choosing the right type of starch for this soup is also very important for this recipe. 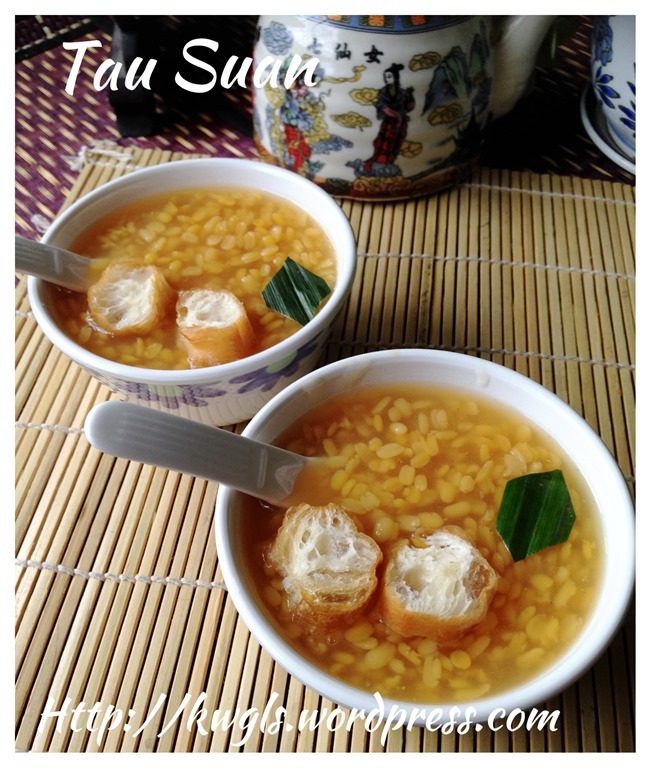 Ideally, the starch should either be water chestnut starch （马蹄粉）or sweet potato starch (番薯粉).. 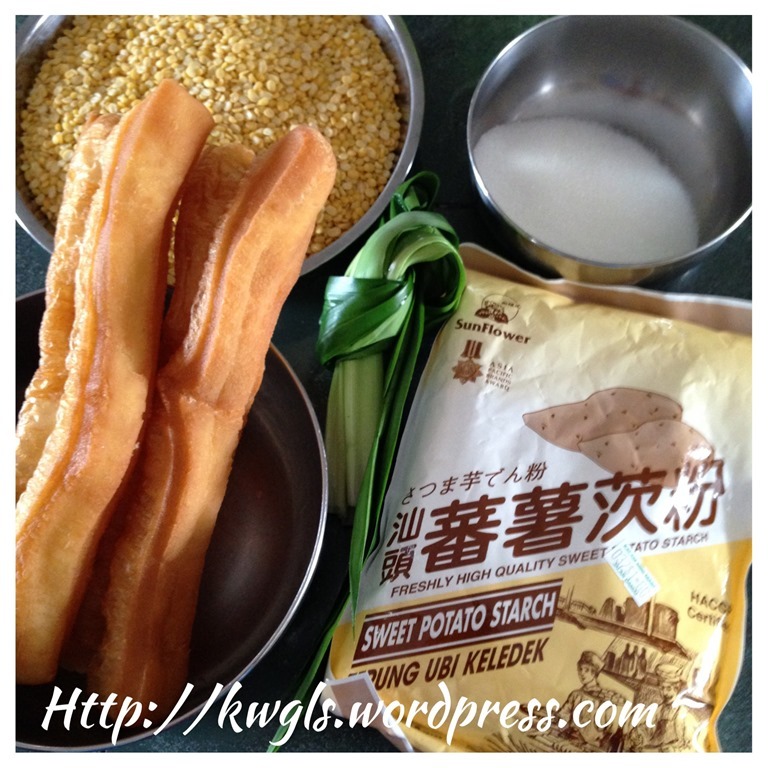 However, you can also use potato starch （土豆粉/马铃薯粉) and wheat starch (澄粉/汀粉)。 Other starches like corn flour (玉米粉）and tapioca flour (薯粉）can also be used but it may turned watery if you consumed 4-5 hours later..
Clean the split mung beans. 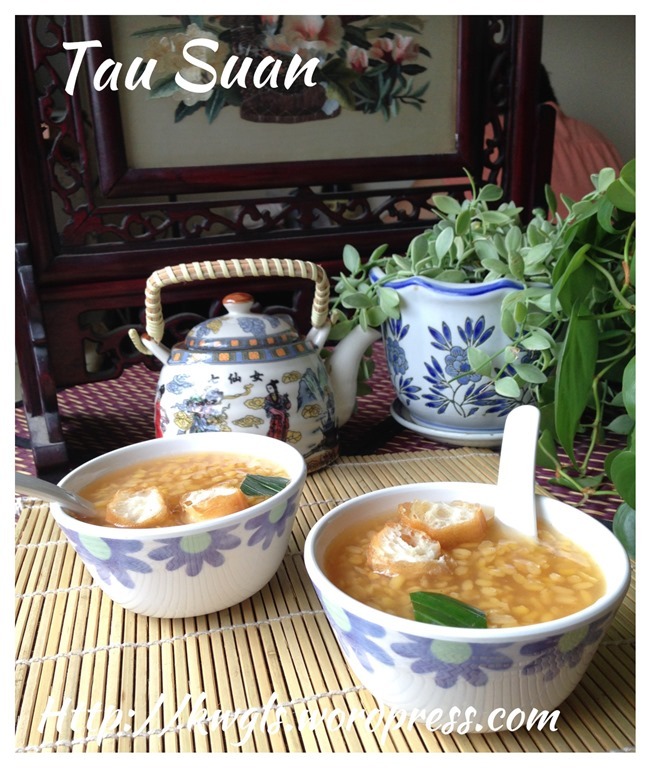 Put a few pieces of Pandan leaves with the mung beans. Transfer to a metal plate for steaming. Add adequate water. 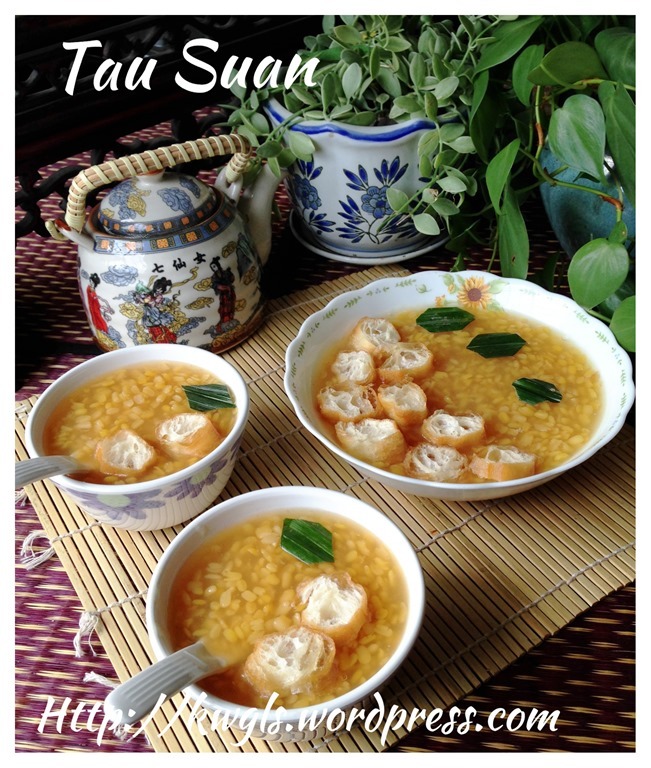 Steam the mung beans until soft which took about 15-20 minutes under high heat. It is advisable to use a bigger metal bowl as the volume of the mung beans will expand. If it is too dry, add some more water to the mung beans and this will expedite the steaming process. In a soup pot under medium heat. Place the sugar, stir until the sugar melts. Continue stirring until the sugar syrup turn brownish. Once it starts to turn brownish, add the water. Be careful that the water may spill out when it is added to the hot syrup. The sugar is likely to be recrystallized and it will be subsequently dissolved in the water. 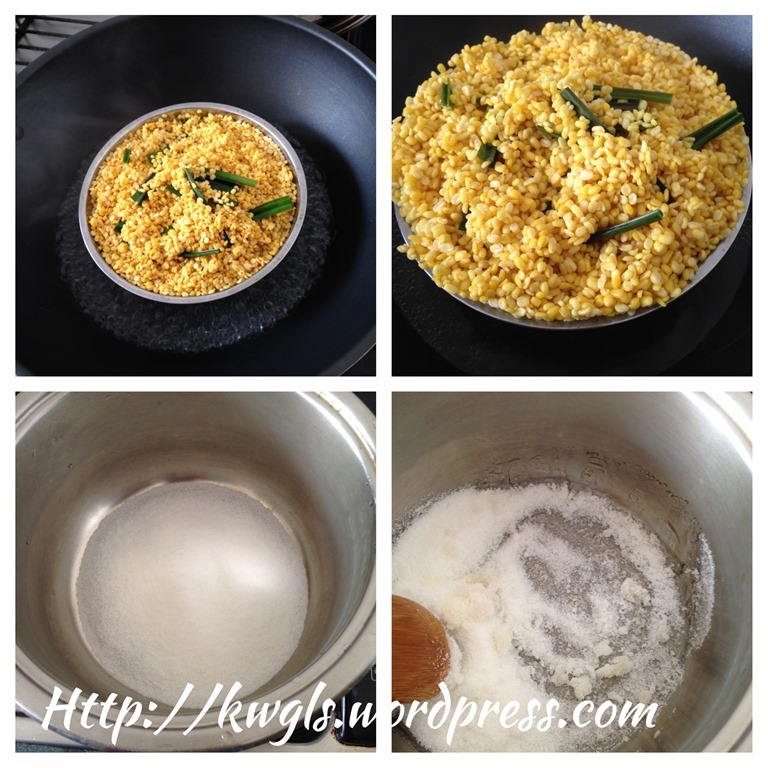 Add the Pandan leaves, followed by steamed mung beans. Bring this to boil. Meanwhile, put about 300 ml of water to the 75 gams of sweet potatoes starch, stir until well mixed. Once the mung bean soup boils. add the sweet potatoes starch solution gradually until it reaches your desired consistency. If you preferred more watery, less may be needed. Constant stirring and high heat is necessary for this stage. Otherwise, the sweet potatoes starch will form some gluey type of substance settled at the bottom of the pan. 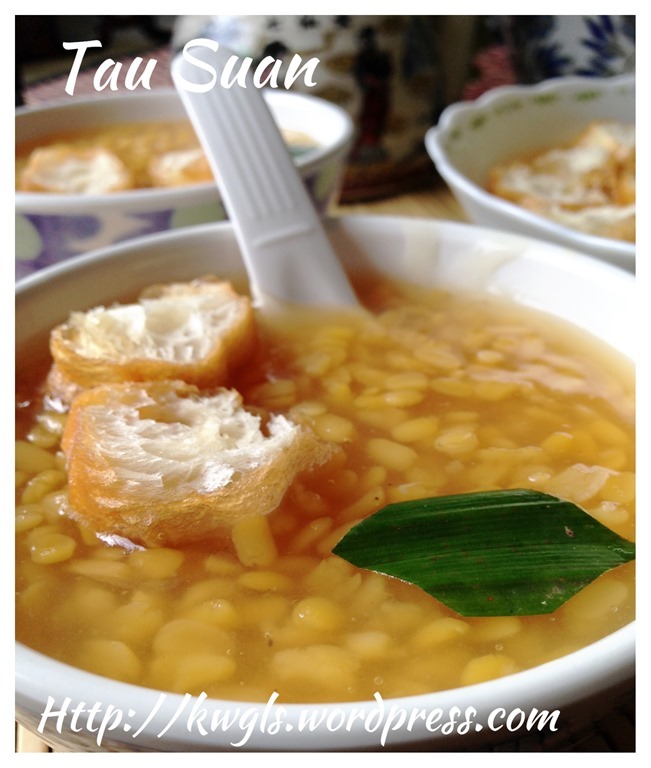 Once it reach your desired consistency, off the heat and best served warm with some Chinese crullers or Youtiao. If it is too gluey, add some hot water during servings. 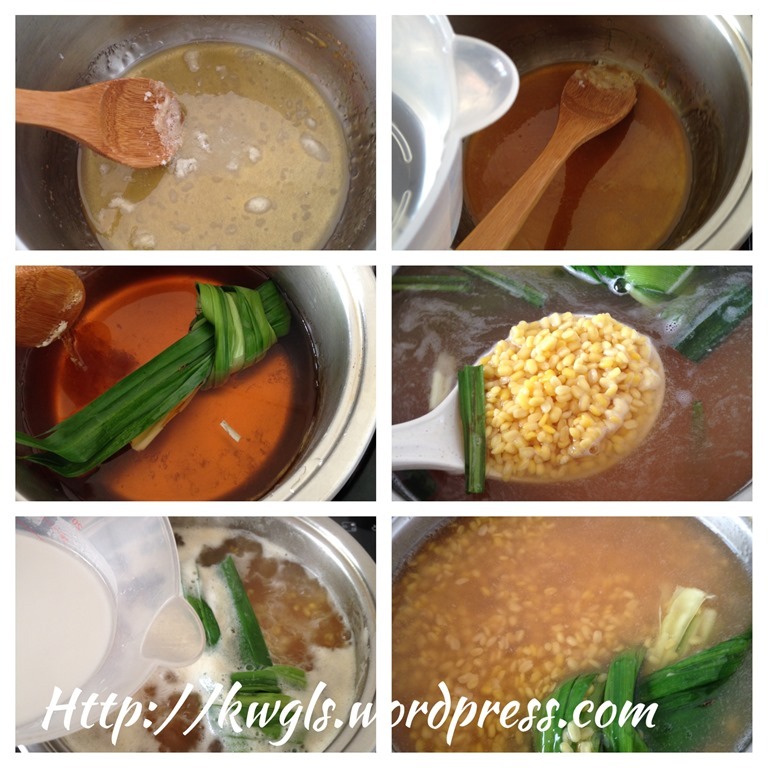 You will know that the sweet soup is too watery if the split mung beans settled at the bottom of the pan. If that is the case, more starches are needed. 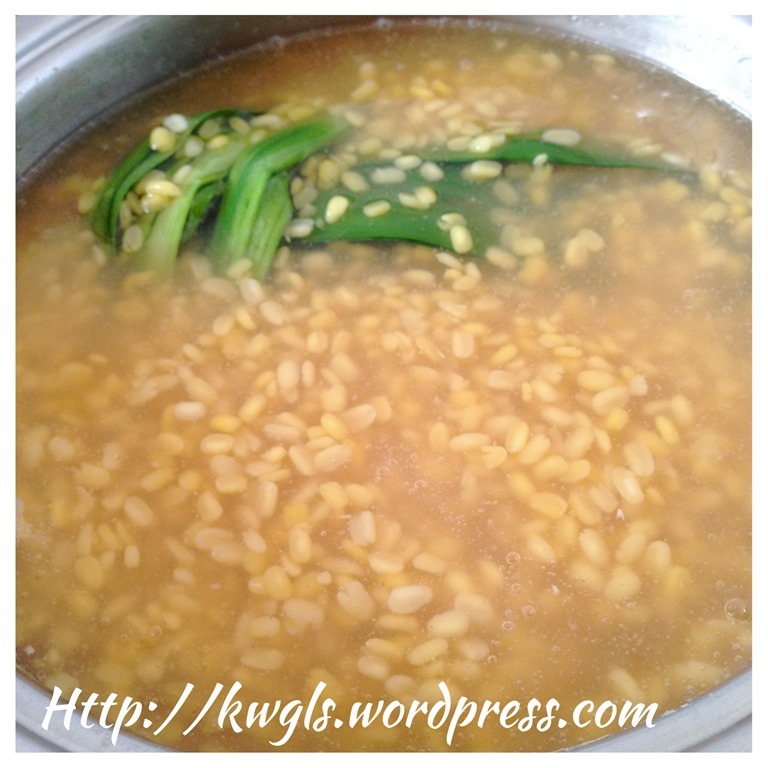 If you do not like this colour of split mung mean sweet soup, you can by pass the sugar caramelization stage. 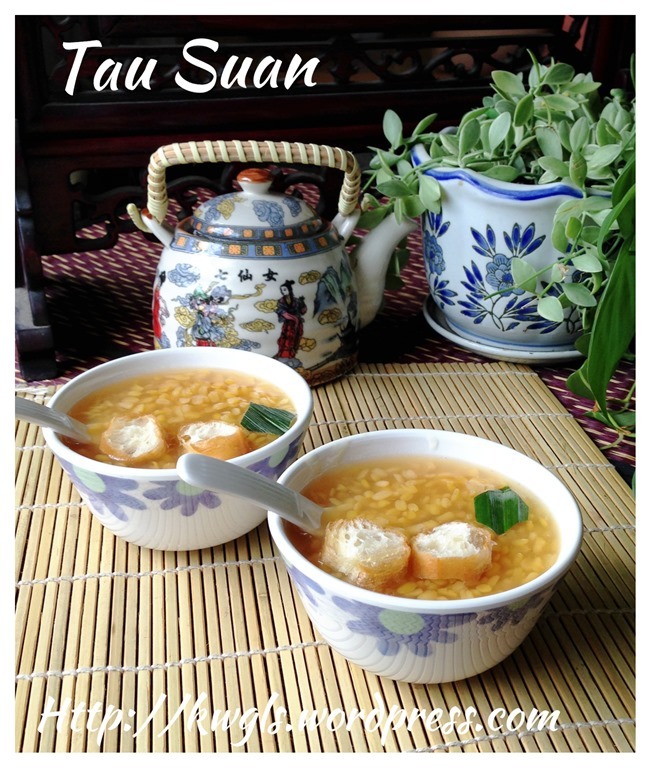 But trust me, sugar caramelization create a special distinct aroma that I really loved… It also masked some of the special smell that comes naturally with the split mung beans. 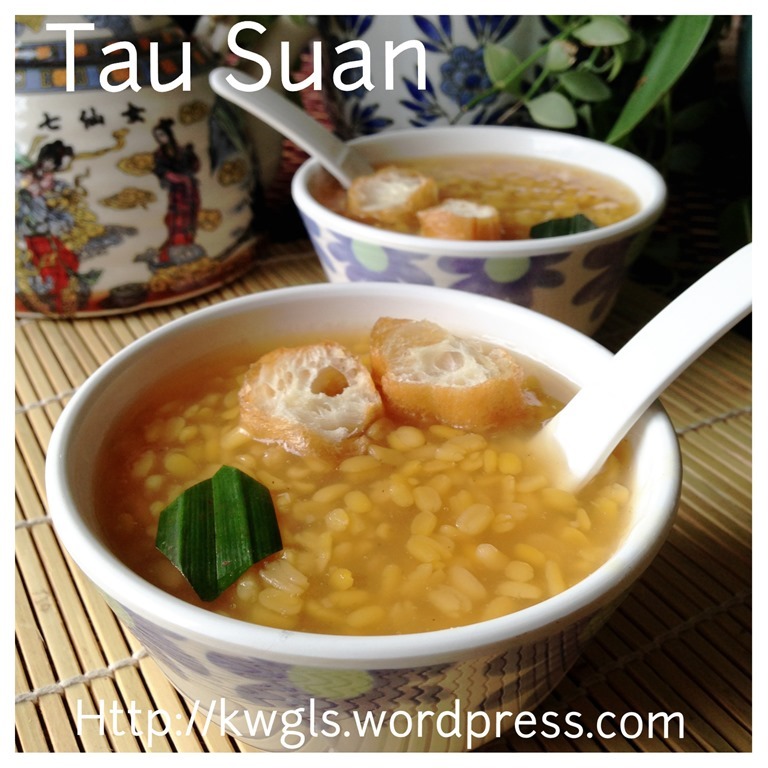 This entry was posted in Chinese and Asian Cakes and Snacks, Desserts, Food Preparation Series and tagged 8, 绿豆爽, Guaishushu, kennneth goh, lek tau suan, postaday, Split Mung Bean Sweet Soup, tau suan. Bookmark the permalink.